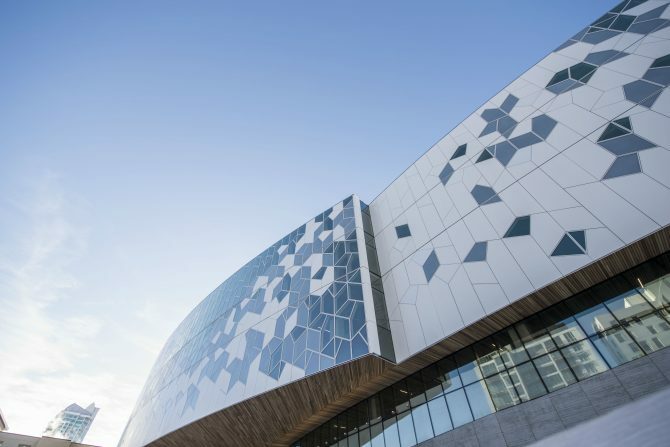 As of November 1st, 2018, the Calgary New Central Library officially opened to the public. On opening day, hundreds of Calgarians lined up down the street for the first look at the architectural masterpiece. During the grand opening ceremony, Calgary Mayor Naheed Nenshi said “It is because of the work of so many people that we are here in this magnificent space today,”. This could not be more true as the project was completed on time and $10 million under budget. We would like to personally congratulate DIALOG, Snohetta Architects, the architects Rob Adamson and Craig Dykers, and the hundreds of workers involved on an extremely successful project. It's difficult to capture the scale and beauty of the new Central Library. Lots of public spaces and quiet places! A massive lineup to get into a library. A library. Well done, Calgary. "...soon to be the most photographed building in Calgary"
Check out this video CMLC posted in August of DIALOG’s Principal, Rob Adamson, and Snohetta’s Founding Partner, Craig Dykers, reflecting on the project and looking forward to the grand opening. Planning for the New Central Library (NCL) began in 2004, when Calgary City Council committed $40 million to the project. In 2011, council committed an additional $135 million from Calgary’s Community Investment Fund toward the NCL. CMLC then contributed $70 million from the Community Revitalization Levy (CRL) to top up funding for the total project cost of $245 million. It was designed by a Snohetta, an international architecture firm with offices in Oslo and New York, with the help of Canadian firm DIALOG. The library's modern design will leave a lasting impression on new generations for years to come. With 100,000 sq. ft. of ALPOLIC's FR material with the White Prismatic Paint finish installed by Ferguson Glass, the external design of the building is said to represent a warm and inviting Chinook weather system. Internally, the hexagonal windows allow mesmerizing beams of natural light into the library for visitors to enjoy. Providing approximately 240,000 sq. ft. of usable library space – 66% more than the existing downtown library – the NCL will be home to a physical collection of approximately 600,000 books, special programs and spaces for children and teens, a technology commons and laboratory for innovation, a centre that supports community integration and advancement through skills development, and much more. For its New Central Library, the City of Calgary chose a prime location: one block east of City Hall in the burgeoning cultural hotspot of East Village. The site provides a key destination and link that will draw Calgarians from downtown through City Hall to the NCL and East Village.